For storage of your files, this Mac mini is equipped with a 2TB PCIe SSD that has a sequential read speed of up to 3.4 GB/s. If you want to add external peripherals, four Thunderbolt 3 ports support bi-directional transfer speeds of up to 40 Gb/s, while also supporting 10 Gb/s USB 3.1 Gen 2 (USB 3.1), device charging, and an external GPU. Thanks to two 5 Gb/s USB 3.1 Gen 1 (USB 3.0) Type-A ports, you'll still be able to connect other devices to this system. 10 Gigabit Ethernet is built in for wired networking, or use dual-band Wi-Fi 5 (802.11ac) for wireless networking. Bluetooth 5.0 technology will allow you to connect additional compatible peripherals, including keyboards, mice, and headsets. Sound is output using a 3.5mm headphone jack. 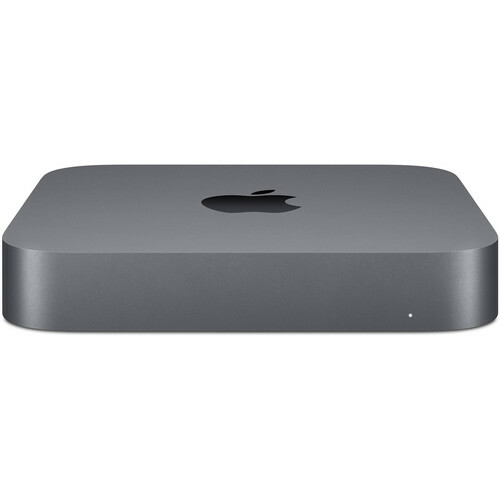 Apple's Mac mini (Late 2018) operates using an internal 150W power supply that runs off 100-240 VAC at 50 to 60 Hz.